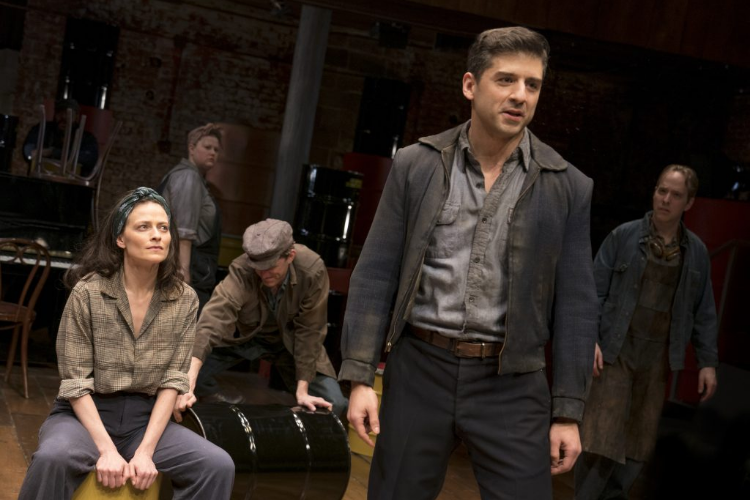 Lara Pulver, Kara Mikula, Benjamin Eakeley, Tony Yazbeck and Ian Lowe in The Cradle Will Rock. Photo by Joan Marcus. BOTTOM LINE: An excellent production of a historically important, if mediocre, play. The Cradle Will Rock is not a masterfully written play, but I suspect the Classic Stage Company already knows that. That’s why they deserve a great deal of credit and gratitude for producing it, providing us with an opportunity to experience firsthand the controversial play that was at the center of one of the greatest moments of civil disobedience in American theatre. While Marc Blitzstein’s script and music are both completely unremarkable, this play with music has lived on primarily because the federal government tried to shut it down. The Cradle Will Rock takes place in Steeltown, USA. A group of anti-union operatives, known as the Liberty Committee, find themselves in prison after the police mistake them for pro-union agitators. Another prisoner, Harry Druggist (Tony Yazbeck), explains to a young prostitute (Lara Pulver) what the Liberty Committee is and how it was established by Mr. Mister (David Garrison), an entrepreneurial tycoon who has the whole town in his back pocket. Later, an actual pro-union advocate, Larry Foreman (also Yazbeck), is arrested and explains to the other prisoners why the labor unions will rise up and prove victorious. Classic Stage offers a first-rate production of a mediocre script. The performances are top-notch, especially an energetic and rousing big finish by Tony Yazbeck. CSC artistic director John Doyle directs and designs a beautiful set that creates the illusion of theatre on a shoestring budget. With high ceilings and ample space, CSC’s theatre feels like a warehouse where labor unions gather to demonstrate, which makes it the perfect venue for this play. From a purely aesthetic perspective, Blitzstein’s play might not seem worthy of a revival. The plot is constructed solely in order to explain the labor ills of its day. And although it’s called a "play in music"—as opposed to a musical—the songs are astonishingly un-hummable, including the title song, which clearly wants to be a showstopping classic (but doesn't quite make it). Obviously, this work of agitprop has an agenda that is obvious, perhaps even anachronistic. In many ways it's a product of its time: not only pro-union, but also deeply anti-capitalist. Then again, with more attention being given to labor union actions, and the increasing legitimacy of socialism in the public consciousness, this may be a good time to revisit it. In any case, it's fun to watch this production while imagining the excitement that surrounded The Cradle Will Rock when it premiered during the Great Depression. The story goes that the Works Progress Administration (WPA) pulled its funding just days before opening. The actors arrived at the theatre to find it padlocked and blocked by anti-union guards. A new venue was found, but the actors' union specifically forbid their members from getting on stage. Yet the cast, along with director Orson Welles and producer John Houseman, refused to abandon the project after so much hard work. So the entire cast sat in the audience and performed from their seats without setting foot onstage. The story is mythic and iconic. It may be that the backstory of The Cradle Will Rock is more interesting than the play itself. Anyone interested in exploring the drama behind the drama should check out Tim Robbins' star-studded 1999 film Cradle Will Rock: being familiar with the history will definitely enrich a visit to this production. The Cradle Will Rock is by Marc Blitzstein. Directed by John Doyle. Set Design by John Doyle. Costume Design by Ann Hould-Ward. Lighting Design by Jane Cox and Tess James. Music Supervisor is Greg Jarrett. Associate Scenic Design by David L. Arsenault. Stage Manager is Bernita Robinson. The cast is Ken Barnett, Eddie Cooper, Benjamin Eakeley, David Garrison, Ian Lowe, Kara Mikula, Lara Pulver, Sally Ann Triplett, Rema Webb, and Tony Yasbeck.